In a research project led by Professor Matthew Watt from the Department of Physiology, Monash University, APAF used mass spectrometry to examine the conditioned media of murine hepatocytes to compare steatotic (excess lipid accumulation) versus non-steatotic livers. We developed a workflow to enrich secreted proteins followed by an iTRAQ labelling approach and reported 168 classically secreted proteins in the media. 32 of these hepatokines were differentially secreted. Amongst these proteins was Fetuin B, and Prof Watt’s team went on to characterise the action of this molecule which impaired insulin action in myotubes and hepatocytes and caused glucose intolerance in mice. The research demonstrates the action of Fetuin B in steatosis contributes to inflammation and insulin resistance. Meex RC, Hoy AJ, Morris A, Brown RD, Lo JC, Burke M, Goode RJ, Kingwell BA, Kraakman MJ, Febbraio MA, Greve JW, Rensen SS, Molloy MP, Lancaster GI, Bruce CR, Watt MJ. 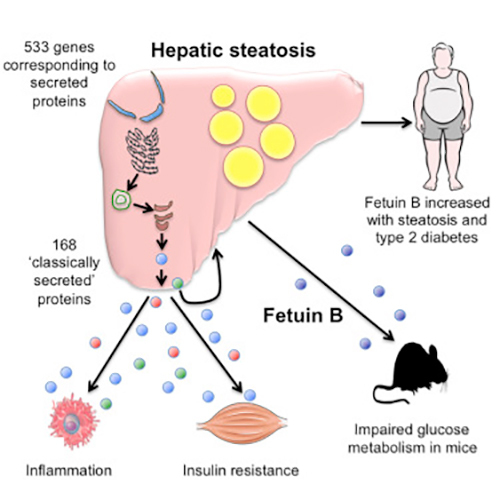 Fetuin B Is a Secreted Hepatocyte Factor Linking Steatosis to Impaired Glucose Metabolism. Cell Metab. 2015 Dec 1;22(6):1078-89.